Shiny Objects documents the prevailing consumer ethos that more is never enough. That happiness can be purchased at the mall, online, or from a catalog. Money and the accumulation of material possessions are such an integral part of our current consumer culture that few have stopped to think how this mad material dash has impacted their quality of life. Until now, that is. 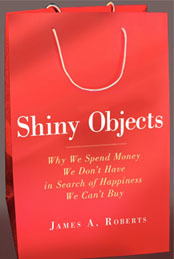 Based upon the latest research on the topic of materialism and written in an easy to understand, upbeat style, with a touch of humor, Shiny Objects addresses how our obsession with possessions impacts our sense of self, the quality of our interactions with others, and our willingness to get involved in community affairs and social issues. The author, James A. Roberts, PhD, is a well known marketing scholar who gives the reader an insider’s look at the current research on materialism and happiness, including many of his own research studies into materialism and the related topics of money attitudes, credit card abuse, compulsive buying, and time affluence. Full of careful research and analysis, Shiny Objects opens the reader’s eyes to how and why we have arrived at such a state of affairs and what can be done to lessen our preoccupation with material possessions. Keep this quiet, but Dr. Roberts even shares the dirty little secrets marketers use to fan the flames of materialism.